Are you looking to put together a Christmas arrangement to take to a holiday party or family gathering? I’ll show you how easy it is to create a simple Winter arrangement. You have heard me talk about the floral design class I am taking, and last week we created a Winter centerpiece. Let me guide you through the process to show you how easy it can be to create your own arrangement. You will need a foam brick HERE, make sure it is the type that absorbs water instantly. When your foam is fully saturated, place it in the container. The holes of the foam should face downward. You will also need a good pair of clippers, I just purchased these HERE and love them. They came as a recommendation from my floral design instructor, but they are a bit pricey. The greens I am using for this arrangement are juniper, pine, cypress, and noble fir. The flowers I am using are carnations, alstroemerias, wax flower, hypericum, and eucalyptus. As an additional design accent, I am adding in a few pinecones and cardinal birds. These pinecones already have picks attached to them, you can find them HERE. Using floral tape HERE, secure the foam to your container. Begin cutting pieces of noble fir and use a thorn stripper HERE to remove the needles on the bottom of the tips. I used a single white candle in the center of my arrangement. I attached and angled several single tips on the sides of the foam and angled 2 larger pieces of noble fir on the top of the foam. Then I added in a few pieces of juniper with berries. I randomly used small pieces of juniper and placed them throughout the centerpiece. Did you know juniper is the primary botanical used to make gin? Interesting little factoid. Small pieces of cypress are also used in the centerpiece but if you have allergies, you may want to skip the cypress, it is an allergen and many people are allergic to it since it creates pollen. Then, add in a few small pieces of pine needles, use the thorn stripper to remove the ends. The flowers come next. Remember to use an odd number of flowers, we used 5. Place them around the foam, couple on the side, and a couple on top..make sure to angle them. Add in the alstroemerias, one flower at a time…instead of adding the bunch. They bend easily so be careful when inserting them into the foam. Add in wax flower as filler. Add in additional pine and cypress as needed until you have filled all gaps in the foam. Add in a couple hypericum berry clusters and more filler. Another interesting little factoid – did you know St. John’s Wort is derived from hypericum? St. John’s Wort is used to treat depression and anxiety. It takes a while to fill all the gaps, add small pieces of pine around the candle to fill the centerpiece out. I also added in 2 pieces of eucalyptus, make sure to use just the tips, so you will need two pieces which will give you 2 tips. 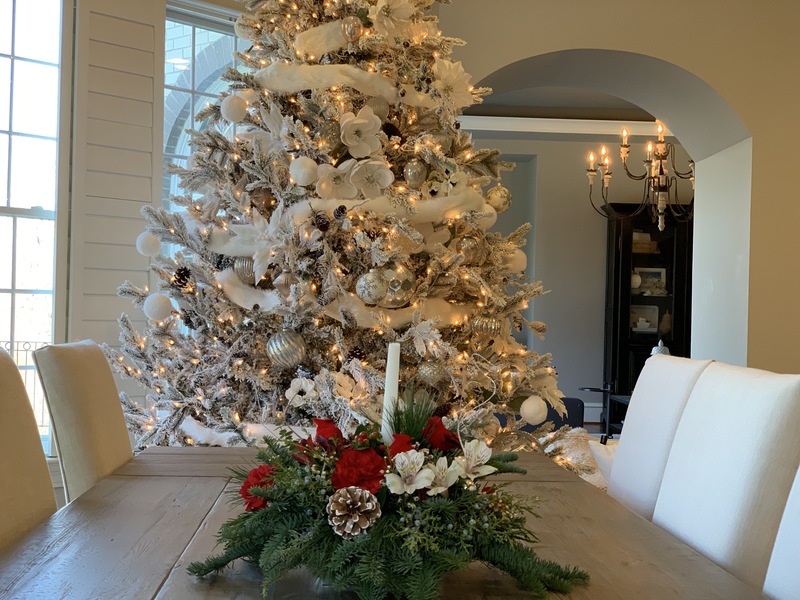 You can check out more pictures of how I used the centerpiece in Christmas Dining Room Home Tour 2018. I hope you gained some insight and picked up a few tips for making a Winter arrangement of your own. If you use my tips and ideas to make a floral arrangement, tag me on Instagram HERE, I would love to see it!